With the rising costs of construction many congregations have to think about their building plans more than they should. Many organizations of faith are turning to Olympia Steel Buildings to better utilize their church building budgets. Organizations are discovering that with our clearspan design they can incorporate metal and steel into their church building plans. 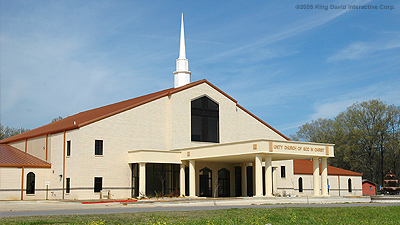 Steel church buildings incorporate a wide variety of materials into their construction to achieve a charming look by utilizing decorative exteriors with glass, stone, stucco and other building materials. These materials can be included in the design of a church sanctuary, cafeteria, gymnasium, meeting hall or just to give your church building more space. 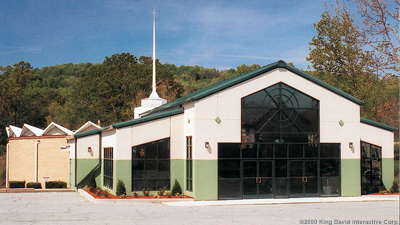 For a small investment, a pre-engineered steel building can accomplish maximum square footage for your steel church. 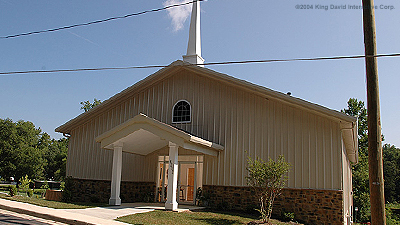 Prefabricated building construction can help keep the costs of engineers and architects down because all of our steel buildings are designed to bolt together for construction ease, helping your church to keep labor costs to a minimum. Save even more money by having your parishioners do some of the work themselves with our easy to follow drawings and construction manual. With over 30 years of experience in the steel building industry and protection of several warranties, we can assist your church with ideas to help keep your construction costs down while still erecting a gorgeous building you and your congregation can all be proud of. Olympia Steel Buildings can assist you with the design and layout of your steel building to ensure that you have the proper amount of space for seating, basketball courts, cafeterias, storage and your stands. From start to finish, our staff of engineers will work together with you so we can create your master drawings for your building permits and help you through all phases of your steel church building project. Over 30 years of design and construction experience.